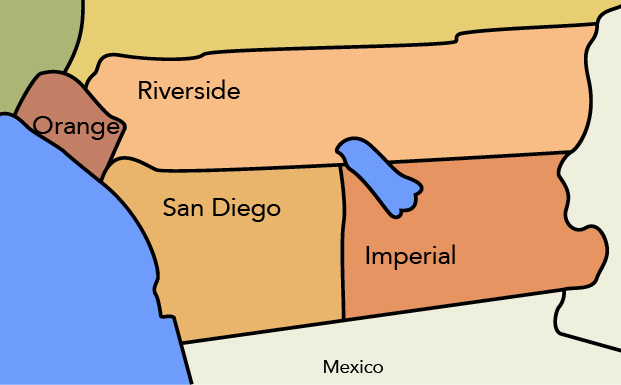 The San Diego and Imperial geographic region, with a total population of over 3.3 million residents and over 100,000 businesses, is home to 10 regional Community Colleges that serves over 2.3 million students each year, 15 major military facilities, an international seaport, an international airport, two growing regional/commuter airports, a 1,633 acre foreign-trade zone, three major international border crossing stations spreading across 144 miles of international border with Mexico, 70 miles of Pacific Ocean coastline on the West, the Arizona border on the East, and bordered on the North by Orange and Riverside Counties. The Career Technical Education Enhancement Fund (CTE EF) “Strengthening Regional Student Employment Outcomes in Key Sectors” proposal will focus on improving the workforce readiness of students throughout the region by redefining student employment outcomes, enhancing occupational soft skills and career readiness training, and increasing students’ accessibility to industry-recognized credentials by implementing four regional projects. Scroll down to learn more about each of the projects! This project will implement the statewide “CTE Employment Outcomes Survey” to all 10 Community Colleges in the San Diego and Imperial Counties. The survey will be administered by Santa Rosa Junior College and will encompass a selected cohort of community college CTE students from the 2013-2014 academic year, which will be approximately 20,000 students. The survey will utilize multiple communication methods – email, US mail, telephone – to better reach the targeted audience. The data that will be compiled and analyzed will provide direction for the regions activities and other initiatives as well as shine a spotlight on vital information regarding the direct link between the educational and career paths of CTE students in the region. In addition, the compiled data will also provide community colleges with a way to improve and redefine student outcomes, assess program viability, and inform local employers/industry. The project will focus on key sectors by exploring best practices for improving student response rates, updating student information, and involving faculty in the process. This project will utilize resources to enhance the college career centers in the San Diego and Imperial region in their efforts to increase internal communication, external outreach, and regional collaboration. Included in these efforts are increasing internal career technical education student recruitment for workforce readiness training; implementing a targeted and regional approach in identifying and recruiting employers for job and internship placement; community and employer engagement; and developing an internship and employer database that utilizes leveraged resources. In addition, the project will look at “out-of-the-box” opportunities to address common problems with work-based learning opportunities and internship placement as well as establish a foundation for continuous communication between college career centers and career technical education students, faculty, and administration fostering an environment of collaboration and innovation focused on student success in the workforce. This project will integrate ACT Career Ready 101 and ACT WorkKeys Assessments into Career Technical Education classes at all 10 Community Colleges in the region to develop and enhance career-relevant skills. Career Technical Education faculty will utilize ACT curriculum to supplement current curricula, enhance classroom activities, and/or provide students with the tools for additional self-paced instruction to build workplace skills. In doing so, Career Technical Education faculty will be giving their students the opportunity to obtain the National Career Readiness Certificate (NCRC) – an industry-recognized, portable, research based credential that certifies essential skills needed for workplace success. The NCRC is the nation’s most widely used job skills credential. In addition, the project will provide professional development for Career Technical Education faculty and staff in the effective use of Career Ready 101 and WorkKeys Assessments, collaborate with other divisions such as Counseling and Career Services to augment existing resources, and work with industry and community partners to recognize and/or promote the use of the National Career Readiness Certificate as a more effective and efficient tool in matching positions with potential employees. The Regional Industry Certification Collaboration (RICC) will research and implement industry certification examinations for all San Diego and Imperial County region community colleges. The RICC will be a partnership of regional industry representatives, college career technical education faculty, and staff and will be a comprehensive and dynamic resource for developing our community’s workforce and economy. State-of-the-art fully equipped facilities in existing testing centers at community colleges throughout the region will be a cost effective option for those looking to attain their industry certifications. In addition, while aimed at current community college career technical education students, the region will also be available to meet the certification needs of former students and members of the public. Certification offerings will encompass a wide variety of skills and be a true benefit to the community.